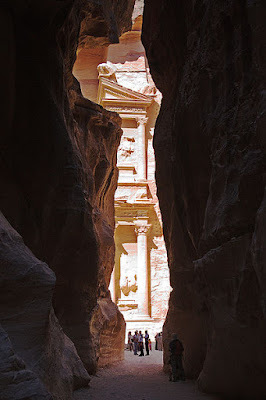 Nothing can prepare you for the magical moment when the sun-bathed Treasury at Petra appears just ahead, framed by the towering pink sandstone walls at the end of the narrow, snaking, kilometre-long siq (gorge). Visitors stop in their tracks. Hearts skip a beat. Eyes widen. Jaws drop. There’s a sharp intake of breath followed by a stunned silence that lasts several seconds while the image ricochets around the brain. Then comes the fusillade of clicks and whirrs as cameras capture that first, unforgettable glimpse. 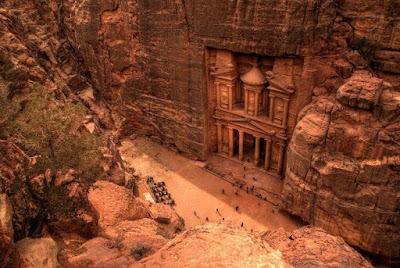 In July 2007 the results of a worldwide online poll that attracted nearly 150 million votes named Petra, in southwest Jordan, as one of the New Seven Wonders of the World. Machu Picchu in Peru, Chichen Itza in Mexico, the statue of Christ the Redeemer in Rio de Janeiro, the Taj Mahal in India, the Great Wall of China and the Colosseum in Rome were the others. Petra’s inclusion on the unranked roll of honour was long overdue considering the Treasury, or Al Khazneh, has been a wonder for more than 2,000 years, though it’s been known to the western world only since 1812 when Swiss explorer Johann Ludwig Burckhardt paid a visit. Burckhardt, who was fascinated by the world of Islam, mastered the Arabic language, studied the Koran, got himself a tan and grew a long beard before he set off in 1809 on his adventures in what are the modern-day Syria, Lebanon, Egypt, Jordan and Saudi Arabia where he travelled around in traditional costume. So thorough were his preparations and so convincing his appearance that he easily passed himself off as an Arab wanderer. His family, however, remained dubious about his professed conversion to the Muslim faith, dismissing it as a turban myth. Carved out of a 50-metre high sheer rockface some time between 100BC and 200AD by slaves and masons using crude hammers and copper chisels, the Treasury gained international recognition following the release of the 1989 Steven Spielberg movie Indiana Jones And The Last Crusade in which it featured. However, film fans keen on entering the temple where Harrison Ford hopped, skipped and jumped his way towards the Holy Grail will be disappointed to discover there’s no great interior to speak of. It’s all a front — but what a front. While the Treasury, which is best viewed early when the sunlight is at its photo-friendliest, is the most famous feature of the 2,600-year-old capital city of the cave-dwelling Nabataeans, it’s not the sole attraction. An hour’s trek into the mountains that involves climbing 800-odd steps sounds a daunting prospect (less-able visitors can hitch a ride on a donkey), but the effort is rewarded with the sight of the Monastery, or Al Deir. Twice the size of the Treasury, it too was carved into a sandstone cliff, and though less intricate in its decoration and ochre rather than pink it’s no less impressive. Completed during the reign of first-century god-king Obodas I, this massive temple built in his honour stands 50 metres high and 45 wide and has a spacious single-room interior (try the echo). Those with a head for heights and the lungs of a marathon runner can tackle the steep path to the left of the facade that leads to the 10-metre ornamental urn on top, but only in the company of a guide. Back at base camp, I chuckled as a thirsty camel delighted onlookers by tipping its head back and drinking mineral water from the plastic bottle gripped in its front teeth. Nearby, the Bedouin owners of souvenir and snack stalls were attracting customers with a variety of comical come-ons. New Zealand-born former nurse Marguerite van Geldermalsen was busy at her stall, selling silver jewellery handmade by local women and signing copies of her memoir, Married To A Bedouin (Virago Press paperback, also available for Amazon Kindle), which has been reprinted more than a dozen times and was flying off the shelves. Marguerite and Mohammad were wed three months later, they lived in a 2,000-year-old cave, she learned Arabic and converted to Islam and they had two boys and a girl. Mohammad died 10 years ago at the age of 50, but Marguerite stayed put, apart from a four-year spell in Australia where she has family. She and Mohammad’s children now live in Jordan and her elder son, Raami, mans the stall when his mum takes a holiday. If you visit Petra while Marguerite’s there you’ll find her a charming lady with a charming tale to tell. Don’t expect to see her dug-out des-res, though: all the cave and tent-dwelling Bedouin families now live in a settlement of whitewashed apartments on a nearby hillside. Twelve kilometres from Petra, the village of Taybeh was once a thriving community that fell into decline and was abandoned in the 1960s when the residents gradually upped and left their homes. Today those homes are enjoying a new lease of life as the 105-room, 5-star Taybet Zaman Hotel and Resort that retains all the charms of village life with the bonus of modern facilities and leisure amenities and great restaurants. It was there, after dinner in a tent beneath a cloudless, starry sky that the Jordan Valley echoed to the sounds of some of Ireland’s best-loved ballads sung in Irish by a couple of my colleagues. Not to be outdone, our guide, Elias, who once played in a successful pop group, then led the waiters in a medley of lively Jordanian folk songs. It was a fun-filled evening, memorable not least for the feast of mezze — dozens of different sharing dishes including kibbeh (lamb meatballs), shanklish (spiced goat’s cheese), makdous (stuffed and pickled eggplant) and falafel — and huge platters of mansaf, a desert-dwellers’ main meal of boiled mutton with rice and yogurt that’s traditionally eaten by scooping it up in the hand, making it more messy than mezze. Having washed down our Bedouin banquet with a few too many bottles of Jordanian wine (it’s really good), the eggplant wasn’t the only thing that was stuffed and pickled as we heaved ourselves on to our coach for the short trip back to the Petra Marriott Hotel and bed. ●STAY: 5-star Petra Marriott Hotel (www.marriott.com). DINNER: International buffet in the Petra Marriott; 5-star Taybet Zaman Hotel and Resort (www.jordantourismresorts.com). LUNCH: The Basin Restaurant in Petra Archaeological Park. It’s impossible to sink in the Dead Sea unless you’re wearing a suit of armour and lead flippers. The 34 per cent salinity, making it nearly nine times saltier than the oceans, is what keeps swimmers bobbing about on the surface like corks. It’s a weird sensation, akin to stretching out on an invisible li-lo. Just make sure cuts and scratches are covered before you take the plunge and avoid getting water in your eyes because it doesn’t half sting, so much so that shaving should be left for later. Only a handful of other lakes have a higher salt concentration, including the chart-topping Don Juan Pond in Antarctica, but at minus 30C it might be a bit chilly for a paddle. The Dead Sea, however, which is bordered by Jordan to the east and Israel to the west, is warm, especially in August when the water temperature is around 31C. On the private beach belonging to the Jordan Valley Marriott Hotel where I stayed on my first day and saw Jerusalem in the distance, guests were plastering themselves with Dead Sea mud from a couple of plastic tubs before entering the water for a pre-breakfast dip. While some coated themselves from head to toe, I scooped up a handful of black goo, drew a crude grid on my chest and stomach and challenged myself to a game of noughts and crosses. I lost. The mud, while messy, is bursting with around three dozen beneficial minerals including magnesium, potassium, natural tar, calcium and silicon compounds that help alleviate skin conditions such as acne, eczema and psoriasis. A hugely-profitable industry has grown up around collecting, packaging, processing and marketing the mud which is in big demand worldwide as the active ingredient in a wide range of beauty products and therapeutic balms. I checked out the prices in Debenhams in Dublin where a 150ml bottle of Dead Sea Magik hair conditioner costs €24, a body mask is €22.50 and a salt brushing scrub is €18.50, proving that where there’s muck there’s brass. Although the Dead Sea region enjoys 330 days of sunshine a year, sunburn is less of a concern than in other hot spots because harmful UVB rays are filtered through an extra atmospheric layer, an evaporation layer and a minimum depletion ozone layer, so you can float without frying. 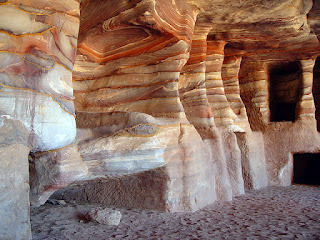 Nevertheless, common sense dictates that visitors should still apply sunscreen, though those who allow their coating of mud to dry and harden, thus ending up Petra-fied, are more likely to bake than blister in the lowest-lying spot on Earth (the surface of the water is 401 metres below sea level and getting lower by about one metre a year because of evaporation). ●STAY: 5-star Jordan Valley Marriott Hotel (www.marriott.com). DINE: El Terrazzo Italian Restaurant in the Jordan Valley Marriott. The amphitheatre in the ancient Greco-Roman city of Gerasa at Jerash, 50 kilometres north of the capital, Amman, was the last place I expected to see two Arab bagpipers marching around playing Scotland The Brave, but life on the road is full of surprises. The skirl of the pipes is a sound that always made the hairs stand on the back of my neck (until they fell out along with the ones on the top of my head), but it’s not to everyone’s taste — the old joke has it that a gentleman is someone who CAN play the bagpipes but DOESN’T. These pipers were good, as well they might be — they’re veterans of the Edinburgh Military Tattoo. For three weeks in August 2010 they were among the Royal Jordanian Armed Forces musicians who played for 217,000 spectators and were seen by a global TV audience of 100 million. While they gave their all each evening, they understandably saved the best for August 18 when their monarch King Abdullah and his wife Queen Rania were the guests of honour. 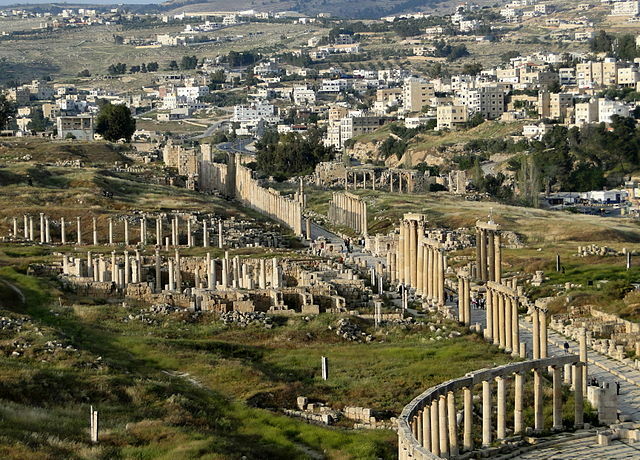 Gerasa, the second most-visited historical site in Jordan after Petra, was founded around 2000BC and enjoyed its golden age following the Roman conquest in 63BC which brought peace and economic development. An extensive network of roads built over the following 170 years connected the city to important trading routes, and the city of around 20,000 people prospered. However, by the middle of the third century its fortunes had waned with the growth of shipping (Jordan’s only port is at Aqaba, 320 kilometres to the south), and Gerasa fell into an irreversible decline. The Persian invasion of 614, the Muslim conquest 22 years later and a series of devastating earthquakes in 749 sealed the city’s fate. The population dwindled, and by the time the Crusaders arrived in the 12th century the place had been abandoned, with not a citizen in sight. Having heard of the Crusaders’ bloodthirsty reputation, they were probably hiding. 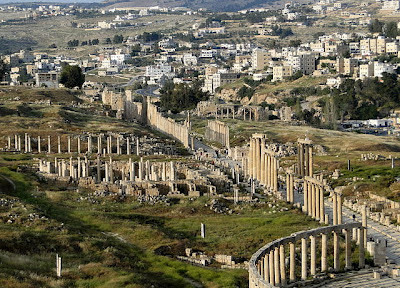 Gerasa gradually disappeared under the shifting sands and only partly re-emerged in 1806 when German explorer Ulrich Jasper Seetzen was having a poke around and uncovered the ornate head of a monumental column. He started digging, and his chance discovery led to a series of widespread excavations that are still going on. In the 206 years since Seetzen stumbled across the buried city, millions of tonnes of sand and earth have been removed to reveal one of the best preserved Roman sites outside of Italy. Archaeologists say we haven’t seen even the half of it yet. Like Burckhardt, who ‘discovered’ Petra, Seetzen immersed himself in the culture of the Near East where he travelled widely, becoming fluent in Arabic, converting to Islam and changing his name to Musa al-Hakim. Among his many early adventures he spent almost a year disguised as a beggar happily and hungrily wandering the shores of the Dead Sea. His big mistake was in later proceeding to Yemen where, in 1811, he got on the wrong side of a local warlord and ended up dead in a ditch. ●LUNCH: Lebanese House Restaurant, Jerash (www.lebanese-house.com). Madaba, 30 kilometres southwest of Amman, is known as the City Of Mosaics, but it’s for one in particular that it’s especially famed, and it’s special indeed. The Greek Orthodox Basilica of Saint George is home to the sixth century Map Of Madaba showing the towns and topography of the Holy Land from Lebanon in the north down to the Nile Delta and from the Mediterranean to the Eastern Desert. Features include a lion hunting a gazelle in the Moab Desert, several bridges across the River Jordan and, curiously, two fishing boats on the Dead Sea. They’d have more chance of catching that gazelle in their nets — any fish swept into the sea from a feeder stream in spate wouldn’t survive more than a couple of seconds in all that salt. Made with two million pieces of coloured stone some time between 542 and 570AD, the Map Of Madaba contains the earliest existing depiction of Jerusalem and has been an invaluable reference for Biblical scholars since it was uncovered in 1884 during construction of the present church on the site of its Byzantine predecessor. The 16 by five metres floor mosaic’s significance is lost on visitors who haven’t done their homework and stand staring at a map with big chunks missing. However, despite the ravages of time and the scuffing of countless feet, its accuracy has led archaeologists to long-buried locations, and as a work of art it more than holds its own. Mount Nebo, 10 kilometres northwest of Madaba and 817 metres high, is a hugely important Biblical site. Moses is said to be buried here, and it was from this vantage point that he peered west into the distance and spied the Promised Land. More recently, Popes John Paul II and Benedict XVI enjoyed the same views which take in the northern end of the Dead Sea and, on a clear day, Jericho and Bethlehem. If on rare occasions there’s no haze, Jerusalem can be seen too. In the Torah, those of the Jewish faith are told that the Ark of the Covenant and the Tabernacle were secreted in a cave deep inside Mount Nebo, but scholars remain dubious. In the mid-third century, pilgrim monks who had travelled from Egypt built a small church on the mountain top, and over the following 300 years it was expanded into a basilica. 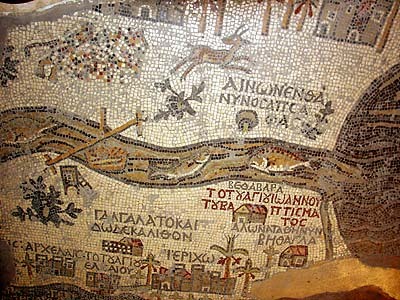 Several splendid floor mosaics were created, and while only fragments of the original church and basilica survive as part of the present day shrine, the excavated mosaics have been restored to their former glory. 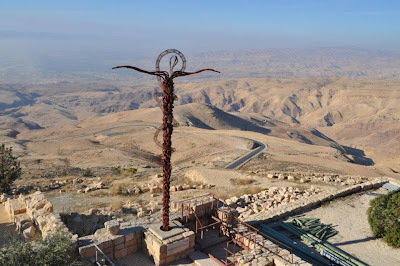 Along with the panoramic views from the terraces, they are a major — but not the principal or most-photographed — Mount Nebo attraction. That distinction goes to Italian artist Giovanni Fantoni’s rusty Serpentine Cross, a symbolic representation of Christ’s crucifixion and God’s command to Moses to raise a bronze asp on a rod to save Israelites who’d been bitten by snakes. ●LUNCH: The Mazayen Nebo Restaurant just a couple of minutes’ drive from the Mount Nebo shrine serves a great buffet. I visited Amman, which is home to nearly three million people, four years ago during a stopover when I spent the day sightseeing before catching the mid-evening flight home. This time I was staying overnight and wanted to see how the Jordanians let their hair down when the street lights come up. The plan was to have dinner in the Deir El Qamar Lebanese restaurant then hit the town. I had an ulterior motive — I wanted to sample the pubs and clubs until the wee hours and headline this article “Gimme, gimme, gimme Amman after midnight”. But it wasn’t to be. Come midnight, after working my way through umpteen delicious cold and hot courses, I was almost comatose. Deir El Qamar is one of those top-notch, top-nosh, don’t-tell-anybody restaurants the locals like to keep a secret in case it gets overrun by tourists, but I’ll risk the wrath of the regulars and tell you it’s fab. Cosmopolitan Amman, which sprawls over seven hills, is the regional base for many multinational corporations, but away from the impressive skyscrapers of the business and financial districts the old town area, al-Balad, that surrounds the colourful souk and the King Hussein Mosque is the place for wandering and buying souvenirs and spices. 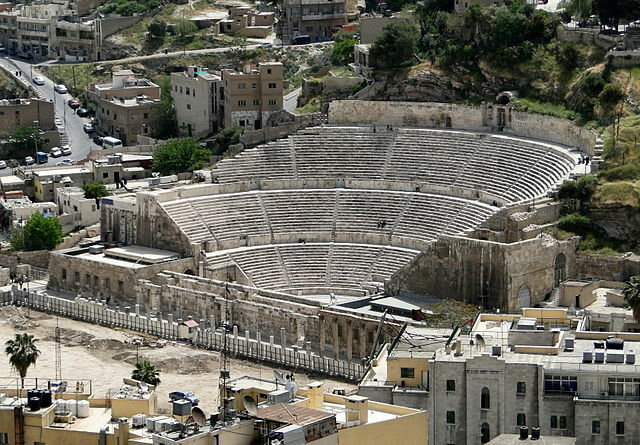 The 6,000-seat Roman theatre, built into the side of a hill between 138 and 161AD by the Emperor Antonius Pius, is the main historical attraction and houses the Museum of Popular Traditions and the Amman Folklore Museum. Its northern orientation was much appreciated by spectators as it kept the sun off their faces, but it didn’t half make the actors squint. The other disadvantage, for those who were performing badly, was not being able to see the rotten tomatoes thrown by the crowd until it was too late. The theatre is still used for concerts, but patrons are no longer frisked for fruit before they enter. The Archaeological Museum on Citadel Hill exhibits artifacts from throughout Jordan, including the Ain Ghazal statues which are the stars of the show. Dating from some time between 8,000 and 6,000BC, they’re not exactly pretty but they are the oldest statues ever discovered anywhere. Visitors can also see some of the Dead Sea Scrolls, including the only one inscribed on copper. The hill, which offers sweeping views, is also home to the ruins of the second century Temple of Hercules, said to have been similar in size and form to the Temple of Artemis at Ephesus. While only a single pillar sticking out of a swamp remains of the Turkish version, thereby demanding a supreme effort of imagination, there’s a lot more left of Amman’s. ●STAY: 5-star Amman Marriott Hotel (www.marriott.com). DINE: Lebanese Restaurant Deir El Qamar (www.deirelqamarrestaurant.com). 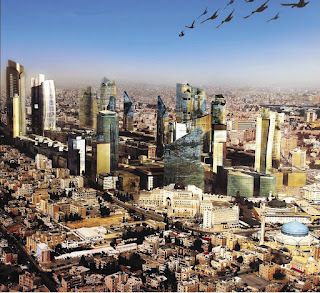 Jordan, which prides itself on being the most stable, liberal and progressive nation in the Middle East, is a place where ancient and modern, traditional and trendy sit comfortably side by side. Nowhere is the contrast more evident than at Petra, the jewel in the country’s crown, where the simple-living locals whose forefathers raised their families in caves interact with sophisticated visitors who’ve flown thousands of miles to stand in front of the Treasury, many on the strength of having seen it in Spielberg’s film. Entry isn’t cheap at 50 dinar (€55) for a one-day pass, but it’s money well spent. Despite the hefty admission charge, keep some change for the cheeky-faced but charming kids who run around all day selling postcards, trinkets, fossilised shells and pebbles split open to reveal their exquisite quartz interiors. A couple of dinar will send them happily on their way. Come to think of it, if the little girl below sold half-a-dozen knick-knacks a day she wouldn’t be too far off earning the average nett monthly salary of €470. Little wonder she’s smiling — good for her! 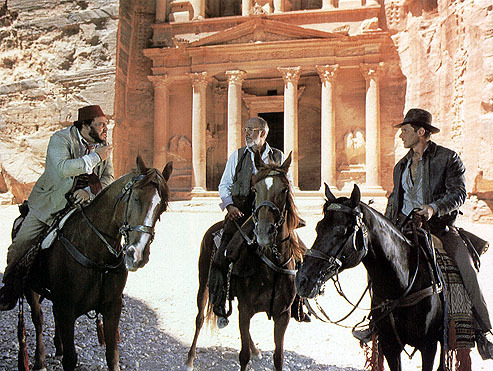 No one knows what the Bedouin guide said in 1812 when the saddle-sore Burckhardt got off his camel in Petra and asked if there was anything worth seeing at the end of that gorge there. Insight Vacations offers 5-day premium escorted tours of Jordan year-round with prices from €899 per person sharing including breakfast and special menu or buffet dinners in 5-star hotels, air-conditioned luxury coaches with business class legroom (40 seats instead of the usual 50), professional tour director, headsets for commentary during guided visits and walking tours, entrance to ancient sites and airport transfers. Return flights from Dublin via London are available from €400. If you want to extend your stay, transfer from Amman instead of flying home and enjoy an additional two nights B&B and dinner at the 5-star Jordan Valley Marriott Hotel from €365pps. ●See www.insightvacations.com, call 01 775 3838 or contact your travel agent.